Basement Renovations | Sarnia, Strathroy and Petrolia | Carosyl Home Additions Inc.
With a little imagination and an experienced renovation team, you can turn your dreary, dark basement into your family’s favourite hangout room. At Carosyl Home Additions Inc., we would love to be part of your upcoming basement renovation project! 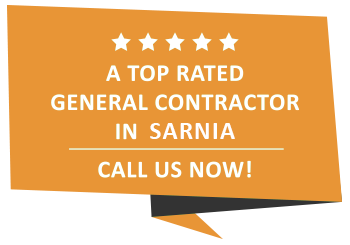 As a leading general contracting company in Sarnia, we offer basement renovation services to homeowners in our area. Our licensed contractors are highly skilled in all aspects of basement renovations, including plumbing, flooring, electrical, and drywall. Renovate your basement with Carosyl Home Additions Inc.! Entertainment: When most homeowners are thinking about a basement renovation, a bar, pool table, or surround sound system comes to mind – it’s easy to see why! Basements can be so much more than a storage area – they are an awesome space to entertain guests or spend quality time with your family! Additional Income: It may have crossed your mind to turn your basement into an apartment. Basement apartments are a great choice for savvy homeowners who are looking to bring extra income. While the upfront cost of kitchenette and bathroom may be seem steep, a basement apartment will quickly pay for itself! Extra Space: As your children become teenagers, they want more privacy – or perhaps, you want them out of your hair. A basement can easily be transformed into the ultimate chill zone by installing drywall, flooring, and lighting. Think about it, you will be able to entertain guests without the added stress of wondering if you have enough room for everyone. You’ll never have to worry over excluding friends from events because there isn’t enough space or kick everyone out when the party has ended because there is no place for anyone to crash. A renovation will do wonders when it comes large scale get-togethers and you will save money on renting out a hall for dinners, reunions, anniversary’s and other gatherings! Another great benefit to creating a livable, modernized space in your Sarnia basement is the ability to expand your home to accommodate an additional bathroom and/or guest’s rooms. You’ll be able to have family visiting from out of town stay with you. They’ll greatly appreciate the gesture and be extremely happy with not having to rent out a pricey Sarnia hotel room. Additional accommodation is especially helpful during the holiday season because you won’t need to deal with the tension of re-ranging your entire household due to inadequate sleeping arrangements for guests. It’s not much of a stretch to suggest that for many Sarnia homeowners, the basement is an afterthought, left alone to guard rubber bins full of keepsakes, house water heaters, or hide laundry rooms and cat litter boxes. As we’ve gone over elsewhere in this article, when you leave your basement unfinished, you leave some of the best real estate in your home unused. Your unfinished basement represents a beautiful opportunity to elevate you and your loved ones’ enjoyment of your home to the next level. Consider it a big life upgrade just waiting to happen. So what’s the problem then? Why does the thought of tackling basement renovations freeze so many Sarnia homeowners in their spots? At Carosyl Home Additions Inc., we have a theory about why so many people don’t finish their basements. But it’s actually two theories. The first reason? Most homeowners have no idea how much it’s going to cost. The second goes even deeper: most homeowners have no idea where to start. Before you even look at your bank balance, Carosyl Home Additions Inc. recommends going all-out and looking online and in design magazines at beautiful refinished basements. Don’t pay attention to price. We’re serious! By giving yourself the freedom to imagine your ultimate basement design, you’ll be practicing something crucial to basement renovation on a budget: knowing what you can and cannot live without. For every homeowner, their dream basement incorporates something different. If money is no object and you choose a $10,000 gold-plated toilet for yourself, that’s probably a good sign that your basement bathroom is more important to you than, say, the flooring. When you’re looking at basement remodeling idea photos, it’s easy to get distracted by the end project. But every beautiful basement has a unique beginning. For a clearer idea of what can be done with the space you’re working with, look at before and after photos. There’s no point in planning a grand palatial basement if you only have 200 square feet to work with! Now that the fantasy planning is out of the way and you know the practical situation you’re dealing with, it’s time to assemble your budget. Carosyl Home Additions Inc. recommends creating a budget spectrum with maybe three different estimates of what you’re willing to spend. The first: your absolute maximum. This should be the point where you start to wince if you imagine going even one dollar over. Then, calculate your bare-bones absolute minimum figure you think you’ll be able to spend and still end up with a good-looking space. Now take those two figures and find a figure somewhere in the middle. Drop ten percent. Give this figure to any basement renovation company or general contractors you’ll deal with, and your basement remodeling should be as painless as possible. Office: In today’s internet age, working from home is not only becoming increasingly easier but more efficient as well. Instead of heading into the office every day and dealing with a traffic filled two-way commute, you can easily be working from the comfort of your personal office space. Carosyl Home Additions Inc. can create a custom built office for you in your basement. We can incorporate just about anything, from additional windows for extra light to personalized storage and shelving space. Gym: When you have gym access in your very own home, it’s likely that you’ll work out more frequently. You won’t need to worry about getting to your Sarnia exercise class on-time or waiting for your favorite machine. You’ll even save money, since you won’t need to purchase a gym membership. If you’re looking to create the ideal workout space, Carosyl Home Additions Inc. can help you to achieve that. Workshop: If you’re someone who likes to work on projects that include woodwork and carpentry, and always wanted your own personal workshop, a basement is the idea spot for that. Bathrooms: Sometimes one or two bathrooms are just not enough, especially for a healthy, growing family! Adding a bathroom in your basement is a very smart move and it will most definitely add market value to your home. Basement restorations are a great investment, not only does it increase the worth of your house it also adds resale value. If you’re looking to renovate your Sarnia home, give Carosyl Home Additions Inc. a call today. If you are in the Sarnia area and want to talk about your basement renovation ideas, get in touch with us! We are looking forward to hearing your ideas and translating them into a space that works for you and your family! We at Carosyl Home Additions Inc. hope you’ve enjoyed our guide to basement remodeling strategies and tips in Sarnia and beyond. Remember that we’re always happy to talk on the phone about what we can do to accomplish your renovation visions. Give us a call today!